Please refer to our stock # T1842 when inquiring. Sold - Thank you! 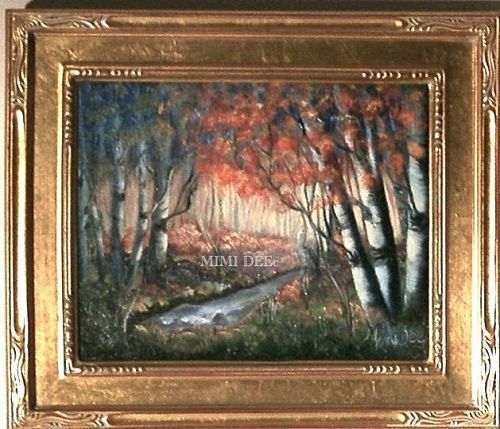 Signed original American landscape painting on linen depicting a lush wooded scene with a soft butter background, and birches in the mid to the blazing right foreground. A stream begins in the back flowing to the left front. Title: Birches and Stream. ID #0225130707 - Sold - thank you! Image size: 8" X 10" on professional archival 100% linen panel. Framed: 11 1/8" X 13 1/8" in a beautiful professional hand applied gold leaf closed corner gallery frame. Sgraffito signed lower right by the self directed painter as: Mimi Dee. No reproductions. Original work by this artist has been exhibited in various area artist association shows since the 90s and at the previously open Methuen studio store gallery by the same name.